Another Kind of Nerd: YES to style! 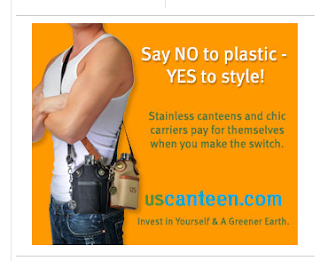 "Say NO to plastic -- YES to style! Invest in Yourself & A Greener Earth." I sort of love the fact that they're so clearly targeting city hipsters. I bet you could actually see some of these when walking around Portland, hipster-central. Methinks it takes a very specific type of individual to walk around with a GIANT canteen slung over their shoulder. But once that very specific individual does it, I wonder how long it will take others to do it? Meh. Environmental Fashion. Add it to the list.